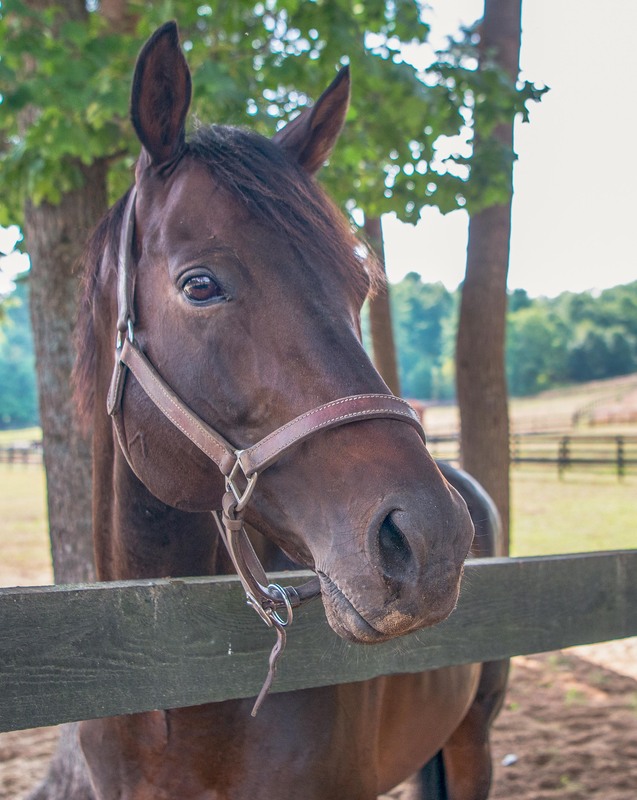 Named for a dear friend of West Point Thoroughbreds, Congie is a sweet and lively Kentucky bred gelding. An ungraded stakes winner, Congie’s career highlight came when he started in the 2011 Preakness Stakes, the second jewel of the American Triple Crown, where he finished 7thto champion Shackleford. On the road to the Preakness, he won the Tropical Park Derby at Tampa Bay Downs and finished 3rdin the Bluegrass Stakes (Gr.1) at Keeneland. After the Preakness, he came in third in the Gr. III Saranac Stakes at Saratoga before finishing his career in an allowance at Aqueduct. In that allowance, he suffered a fractured leg and was retired. He retired with a record of (2-1-3) from 11 starts and earnings of $243,740. Upon his retirement, his owners sent him to a trusted friend, who in turn sent him to one of their friends. In the fall of 2016, Congie was found in an auction house in New York by another horse rescue, Rosemary Farms. Had they not been there, Congie could have been sold to a slaughterhouse outside of the country. Rosemary Farm then contacted West Point Thoroughbreds, who were upset to learn of the circumstances surrounding Congie’s rescue. West Point reached out to Old Friends to secure a safe home for him and have graciously offered to support Congie throughout the rest of his retirement. Thanks to the cooperation of several groups and caring people, King Congie now has a forever home at Cabin Creek. Congie has been gelded and will hopefully be with a paddock pal in the spring. Want to Sponsor King Congie's Care? Donate now and receive your certificate and photo of King Congie!